Categories: 0-10 V, 4-20 mA, Analog, Output, Type Of Transmitter, Transmitters, Input, RTD, Isolation, Unisolated, Measuring Channels, 2 Measuring channels, Design, Rail Mounted. 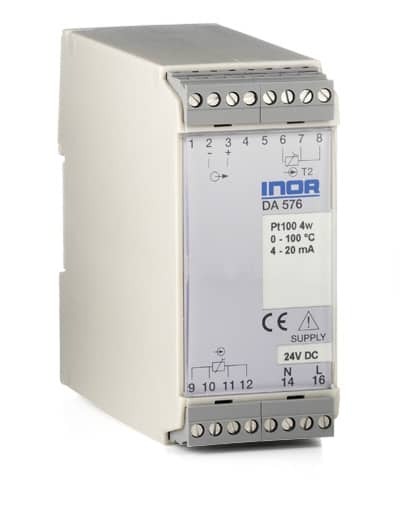 DA576 is designed for input signal from one or two Pt100 sensors in 4-wire connection and output in mA or V. Thanks to a unique design DA576 provides an outstanding accuracy of ±0.03 °C (±0.05 °F) in both absolute and differential temperature measurement. DA576 can be calibrated for measurement spans down to 5 °C (9 °F), e.g. -2.5 to +2.5 °C. Each unit is delivered with a calibration certificate. The ideal transmitter for measurement of power/energy in hot water systems and efficiency in cooling systems.